The three fractional-weight coins in the Proof Gold American Eagle Series enjoyed impressive leaps in demand in 2007. Each one of the three options increased by roughly 10,000 coins from the 2006 year in which demand for the fractional weights dropped off in the face of other collectible options. 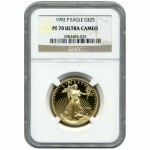 Right now, 2007 1/2 oz Proof Gold American Eagles are available to purchase online at Silver.com in perfect condition. Ships to you housed in an NGC protective plastic slab! 21st issue of the Proof Gold American Eagle in 1/2 oz weight! Availability limited within the original 44,025-coin mintage! Lady Liberty appears on the coin’s obverse face. American bald eagles are depicted on the coin’s reverse side. 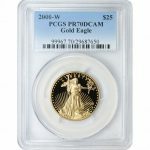 Each of the 2007 1/2 oz Proof Gold American Eagles in this product listing at Silver.com includes a perfect certification from the NGC. Coins with a PF70 grade exhibit full, original mint luster and no detracting flaws on the surface areas or design sets. The ultra-cameo designation earned by these coins highlights the beautiful visual appearance of the coins. The design sets have strong, frosted matte elements and deeply-mirrored, clear background fields. 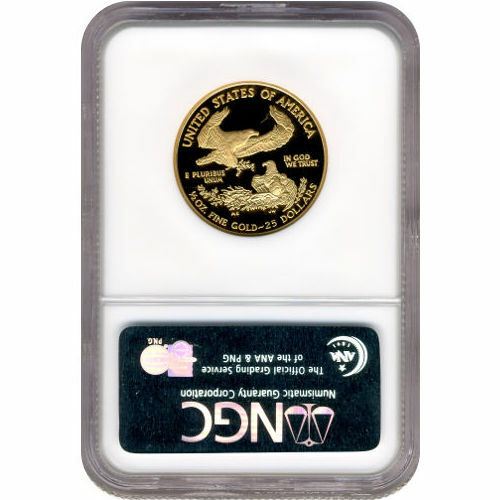 Mintage of the 2007 1/2 oz Proof Gold American Eagles rose by 9,703 coins from the 20th-anniversary release of the coins. The 1/2 oz Proof Gold Eagles had a lot of competition in 2006 from the new Burnished Gold Eagles, which were also available in fractional weights, as well as the 20th-anniversary collectible sets. 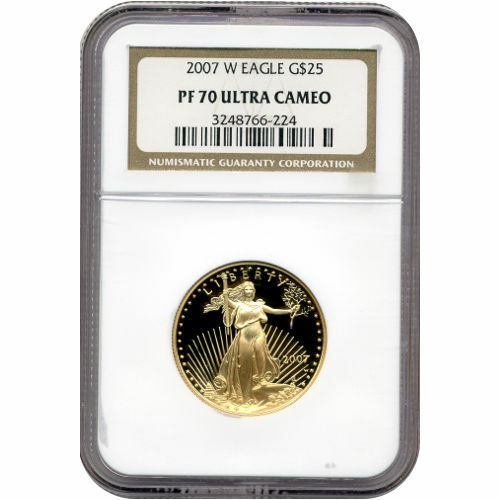 On the obverse of 2007 Proof Gold American Eagles is the image of Lady Liberty. This design was created in 1907 by Augustus Saint-Gaudens and used on the $20 Gold Double Eagle coin from 1907 to 1933. The reverse side of 2007 1/2 oz Proof Gold Eagles features a design found only on the Gold Eagles from the US Mint. Designed in 1986 by Miley Busiek, the design is the only one on American coinage to feature more than one bald eagle in the design. If you have any questions about these coins, please don’t hesitate to ask. Silver.com customer service is available to you at 888-989-7223, online using our live chat, and via our email address. You can also use our website to track changes in the price of gold per ounce.